I have to say I was a bit wary of buying a new reworked model year SUV but in the 6 years I owned it I did not have one major issue with this SUV. I did all appropriate service intervals and changed the oil regularly and it ran great. I live in Chicago so winters can be rough on an SUV but no iginition issues and it was a very reliable and safe SUV to drive. As I had said said before. I love the new look for the explorer. It definitely has a more upscale feel and the interior was very rich and impressive. One of the most impressive parts of the exterior was not nessisarily the styling but the fact that the front of the car is shaped in a way that when you are pulling out of a close space with something directly in front of you the 11 Ford Explorer gives you a vision line that you think might be close but I have not once bumped the car or object in front of me. This vision line gives you a little wiggle room so you don't bump or scrape the object in front when pulling out. 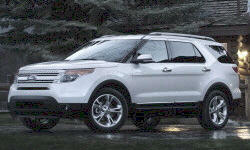 Having had my 11 Ford Explorer for 5 years and loved itthe entire time. The people who whine about the technology not working, in most cases I would bet are not really up on technology in general.This new modelhad a few tweaksalong way, column noise, etc. but these werenot anything major and pretty easy to deal with.The rest of the complaints I would say I have heard are really spuratic things that come up with pretty much any car. I have just two minor complaints, Thesound the turn signal makes is way too soft. Many times I left the turn signal on because I didn't hear it and the ecoboost engine on my Limited seemed to drop out during acceleration. This was the only biggy for me.